A photograph provides a window into the past. And, sometimes, the really great photographs intrigue you; they pique your interest to the point that you just want to see and understand what was going on outside the frame, or in the moments just before and after the photo. 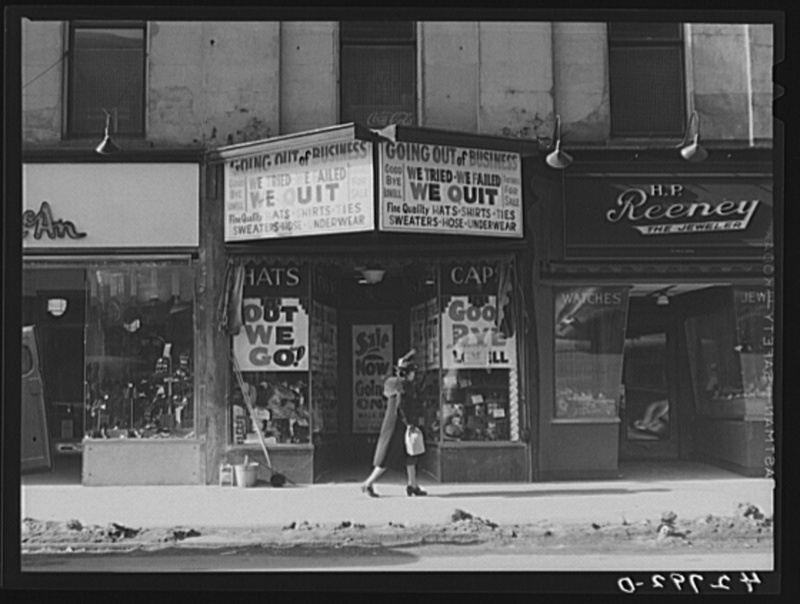 Take this photograph, memorialized as ‘Store Going out of Business – Lowell, Mass.’ in the Library of Congress’ Prints and Photographs Collection. Jack Delano, a 20th-century American photographer known for his work with the Farm Service Administration, captured the iconic photo in Lowell in January 1941, as the mills were closing, and as downtown stores were failing. Its story, captured in one of those unforgettable, moment-in-time images, recalls a time when Lowell was in decline, with one-third of its citizens ‘on relief’ as the city was losing the textile industry that had defined it for much of the preceding century. “Going out of business. We tried. We failed. We quit.” The sign states. Maybe you’ve seen this photograph before. Maybe you’ve wanted to know where the photograph was taken in downtown Lowell, exactly. There are three quick tips that anyone can use to unlock the secrets of old photos. Look for identifying characteristics in the photograph. There’s no name on the store going out of business, but there are some names on neighboring storefronts. H.P. Reeney is the easiest to read; his name is prominently displayed on the storefront to the right. If you look to the left, you might recognize that lettering, and find yourself remembering those end-of-summer trips to the shoe store each year as Labor Day approached. 2. Look to see where those stores were located at the time of the photo. Since Thom McAn was a pretty popular chain, and may have had multiple locations – even as early as 1941 – it’s best to start with H. P. Reeney. With a quick search of old newspapers, it’s easy to find a mention in the local paper. And, with that, we know that H. P. Reeney was located at 65 Central Street just a few months before Jack Delano snapped his photo. But, where was Thom McAn? Back we go to the newspapers from 1940. So, if we’ve determined that Jeweler Reeney is at 65 Central Street and Thom McAn is at 69 Central Street, that must mean that the closing mystery store is at 67 Central. What can we find with a search on 67 Central in 1940? Almost nothing. Sometimes, the trail goes cold. There was this photo, of a store moving into 67 Central Street, later that year, but it’s pretty clear in the original photo, with the woman’s winter coat, and the small snowbanks lining the curb, that it’s earlier in the year. This is a photograph of the store that replaced the closing store. But, the photo does give an idea of what the interior of the store going out of business might have looked like. So, the closing store didn’t have much of a presence in the local papers, which probably explains why they were giving up, if they didn’t quite prove that they tried at all. With no further mention of the address mentioned in the local papers, I went to city directories, which showed that Essex Hat Stores was in that spot in 1940. The mystery behind Jack Delano’s old photo is solved, but, as is the case with historical-based research, a new one emerges. What does the site look like today? What type of store occupies the site? Photographs d0 capture a moment in time, before that moment disappears forever. In this case, Jack Delano captured Lowell as it suffered the demise of the mills, 75 years ago, and at least 35 years before Lowell began to enjoy the great recovery which brought the renewal (and investment dollars) so prevalently visible along today’s city streets, and in the city’s renewed and restored architecture. Ryan, I would like to make a connection. I have been doing research on Lowell and the mills for the last three years and have a book in progress. I need visuals, for the cover, and possibly for the insides. History tends to reveal itself as two dimensional, but characters always have three (or more) dimensions. This book, a historical fiction, works on that in the period 1810-1850. But I need visuals. I’m looking for some photos of Saint Peter’s church in Lowell Massachusetts On goreham street .I did find a rear picture in 1996 when I got demolished .But does anybody have any photos of Saint Peter’s church in 1993 . REALLY enjoyed this post and the detective work involved. Mission accomplished – You had me intrigued right from the beginning with such an interesting photo. Following along with your process of solving the mystery was a very enjoyable way to spend some time. Thanks for posting! I’ll be liking to this post from my blog as well. Hi Chris, thanks! Glad you enjoyed this post. Which reveals the name of the store (“Essex”) in two places on the window glass, in addition to an “SX” over the entrance, and a couple more nearby. You may have been notified already, but Shorpy just posted a hi-res scan of this photo. Click the photo for full size. Enjoy!